Smith has put a black pin on a map of the United States for just about every paper shuttered since 2008. Last year, the map contained 37 pins. This year, it was filled with 106 pins in every corner of the country, including several single pins representing the shutdown of multiple weeklies published by a common owner. In all, Smith tallied 142 daily and non-daily shutdowns in 2009, or 2.7 times more than the 53 papers she listed in 2008. At yearend 2008, there were 1,408 dailies published in the United States, according to the Newspaper Association of America. Smith is reporting that nearly 15,000 newspaper jobs were lost this year on top of a like number in 2009. But the federal employment statistics suggest the toll may well be higher. As of the end of November, the U.S. Bureau of Labor Statistics said 90,000 jobs were lost in the non-Internet publishing industries, which would include books and magazines, as well as newspapers. Pink slips continued to fly even as Christmas approached. :: The residual monopoly power of the industry. While newspaper profits have been bludgeoned by an epic and accelerating downturn in advertising sales since April, 2006, most publications continue to make substantial sums of money, owing to their monopoly position in most of the markets they serve. Essentially unrivaled control of print publishing over the years enabled publishers to build highly profitable businesses by extracting high prices for advertising. Even though increased competition from the interactive media in recent years has been exacerbated by an unprecedented decline in the economy, most papers continue to operate profitably – though nothing like the nearly 30% operating margins many formerly enjoyed – by cutting headcount, squeezing newshole, trimming circulation and outsourcing a wide variety of functions to cheaper vendors. These one-time-only savings cannot be replicated in future years and, in fact, may serve to weaken demand for the hollowed-0ut products now produced by most publishers. If advertising demand returns when the economy recovers, publishers may be able to reconstitute their publications to reinvigorate consumer and advertiser demand. The risk is that increasingly compelling interactive media, combined with the self-cannibalization of newspapers, have turned off many readers and advertisers forever. :: The magic of the bankruptcy system. Instead of investing in the creation of new Internet and mobile businesses, publishers took advantage of the cheap interest rates in the middle years of this decade to borrow billions of dollars to either purchase other newspapers or take publishing companies private. The success of this strategy depended on robust and reliable increases in sales and profits in subsequent years, which, as we know now, spectacularly failed to materialize. While many newspapers continue to turn out respectable profits in even these straitened times, a half dozen publishing companies landed in bankruptcy court when they were unable to generate sufficient profits to keep up with payments on the enormous debt they had assumed. The magic of bankruptcy is that the court has the power to wipe the slate clean, relieving publishers of debts they cannot pay, unpaid invoices accumulated prior to the bankruptcy filing, leases they no longer need and, in certain cases, obligations under union contracts. Companies like Journal Register, Sun-Times and Minneapolis Star Tribune got a fresh start in bankruptcy court in 2009 to try to build businesses that can profitably sustain themselves in an era when newspaper readership and advertising appear to be in an irreversible decline. Economists call this a secular contraction, which is different than a cyclical contraction that reverses when business conditions improve. The Tribune Co. and Philadelphia Newspapers LLC are hoping to be discharged from bankruptcy court in 2010 so the very same managers who unwisely piled too much debt on the companies can get a fresh whack at running them again. Some of the unwise lenders who lost billions at Tribune and hundreds of millions in Philly are wisely petitioning the court to install new leadership at each company. :: The irrepressible optimism of publishers. Hope springs eternal among publishers that the woes of the newspaper industry are not a secular shift in their business but nothing more than a severe by-product of the worse economic downturn since the 1930s. By cutting costs, renegotiating debt or seeking bankruptcy protection, newspaper executives have done a masterful job of staying afloat (albeit by throwing tens of thousands of colleagues over the side) during the most treacherous business conditions most of them have ever seen. They are counting on an uptick in the economy next year to stop on a dime the four-year skid in advertising sales that began well before the economy tanked. Like the construction industry, manufacturers, retailers and people in every other type of business but Goldman Sachs, newspaper publishers have kept their battered companies on life support in the hopes that a turn in the economy will rescue them. While you can imagine the day that construction will revive, manufacturing will pick up and consumer optimism will return, newspapers face a set of more profound fundamental challenges than most other industries. 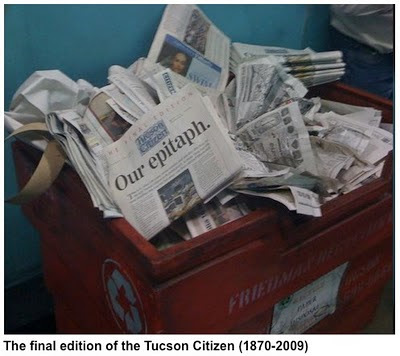 If unbridled cost cutting and raw optimism are enough to save newspapers, they will be just fine. If it takes more than chopping expenses and praying for the economy to rebound – which seems to be the prevailing industry strategy – then, unfortunately, we haven’t seen the last newspaper close. Was The Ann Arbor News the only paper to shut down in which it was the town's sole daily newspaper? A tough distinction, but of all the daily shutdowns, didn't most have competitors that still exist, such as the Rocky and Denver Post? Yes, but I think you should also consider the Web-based startups that are gaining a foothold in solid journalism. Take a look at Crosscut Seattle, Minn Post, and Politico to mention a few. I think the Web-based product has improved. Shouldn't that "no FEWER than..."? Gadzooks. Can people PLEASE stop saying the Ann Arbor News closed down? Is this what we have to look forward to ... misstatements what, six months after the fact, still being repeated? My father still receives the Ann Arbor News delivered to his home, twice a week, loaded with news AND ad inserts. And that's where they're making money, those inserts. Those produce much more revenue than online advertising. Newspapers that move out of daily print need not end up with "scaled back" online operations. Do it right and you can energize your website. Ending daily print (though, as Abe McLaughlin points out in an earlier post, launching a weekly print magazine that has been growing in circulation) allowed us to step up our Web-first journalism. That has meant faster, more frequent posts that respond to news as it unfolds -- rather than one massive upload after the print deadline. Result: Our Web traffic is up more than 30 percent year over year. Thank you, Brian Steffens, for injecting some inconvenient facts. But I have to hand it to the Newsosaur for once. He at least pointed out that most newspapers remain profitable. And how about the leaps-and-bounds growth in online revenue in 2009? Oh, wait a second, there wasn't any. Yes, those newspaper expansions and debt loads turned out to be irresponsible and unsustainable, but the obit on print is far from written, except by the cyber doom prophets who still keep congratulating themselves on how clever they are to be part of the future, not the dinosaur past. Tell you what, who here would trade the revenue/profitability of a mid-sized or even small monopoly newspaper for an up-and-coming Web operation not named Google, Yahoo or the very few others in their class? There does seem to be a trend toward fewer print issues (but perhaps bigger and better) and better and faster online postings. It would be a shame to lose the daily print product. But it wouldn't be the end of it all. Will dailies becomes weeklies or monthlies? Perhaps twice a week issues (mainly for ad reasons) with a larger monthly edition that aims to cover more enterprising topics?? These are just different models for delivering the news (and ads). It's a quibble, but because the Seattle Post-Intelligencer dismissed 90 per cent of its staff and management and the business entity that operated the paper formally ceased operations, the Seattle P-I should probably be classified as a closure. The web operation continues as primarly an aggregator of local bloggers and wire material. It is timely that the print media is vanishing. It coincides nicely with the educational system's products who are now not even able read a newspaper and understand what they are reading. Papers traditionally printed at ninth grade level so be as inclusive as possible with the 'dolt level' reader in mind. If they try to operate at a lower level, there won't be enough usable words to make a decent point. Sooooo, things are unfolding as they should. Devolution is alive and well in America. On the upside, most of the up and coming generation is happy to communicate with acronyms and pictures on their hand-helds ... but the distraction level is high. Given enough time, we will eventually produce a generation of young people who only know how to play with tech stuff and nothing else. That is when Allah will take over. So the young people are not as educated as your generation, eh? This claim has been made every generation for a century. If not for Elvis, then the Beatles, then computers, this would be a great country. Today's generation is highly sophisticated and technologically saavy, voted in record numbers in 2008, and is very interested in current events. Its members simply don't buy news printed on dead trees. They read it online. Get over it. Then go back to your front porch, where you are probably great at shaking your fist at passing cars.